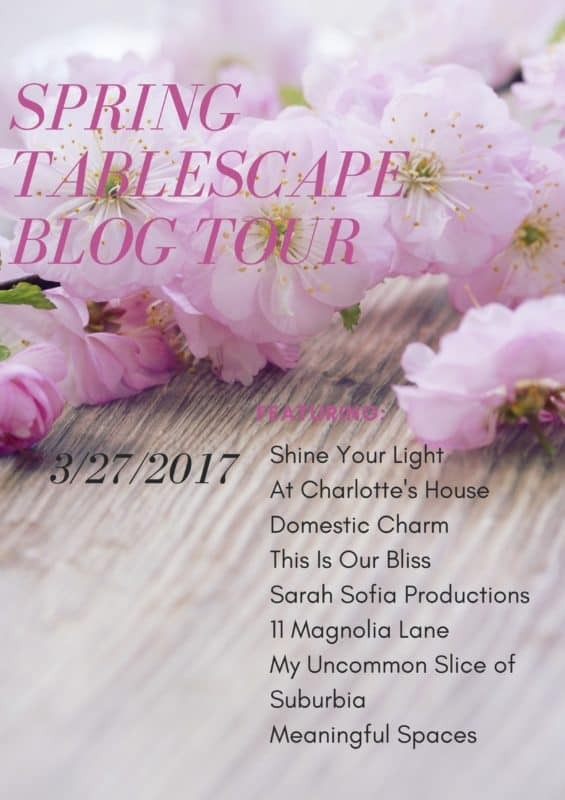 Today I’m so happy to be joining some amazing bloggers to share ideas for bringing springtime to your table! If you’re visiting from Meaningful Spaces, I’m glad you’re here! Welcome to a laid back, fun, casual spring brunch! The sun is shining, music is on, coffee’s hot! Can I tell you how excited I am for life to start emerging from our (still snowy) winter earth???? 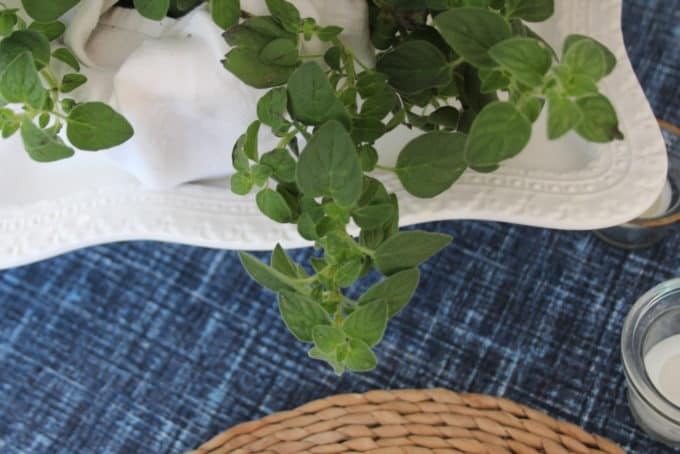 When I saw these cute potted herbs at Trader Joes I knew I had to use them for a spring table – they fulfill my need for green! This table has lots of room for stacks of pancakes, fruit and maybe a mimosa or two! I love uncrowded tablescapes that are pretty, feel a little special and allow everyone to see each other without moving the centerpiece! Candlelight is a must no matter the time of day. The runner is a remnant of fabric whose raw edges I left exposed. Each pot has three varieties of herbs and I love how they trail over the sides. They are perfect to give to your guests as a little gift when they leave! I wrapped the pots with white cloth napkins, tucking the ends into the pot and securing them with push pins. Unfussy, and comfortable enough for lingering, listening to music and chatting long after the meal, that’s my favorite part! 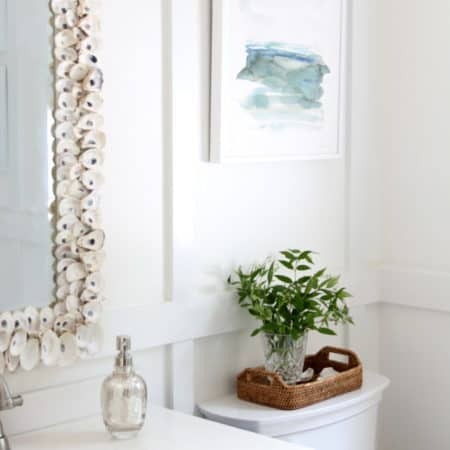 In this social media-Pinterest loving world, I think we can all put a lot of pressure on ourselves to make our homes, how we entertain, how we LIVE, look picture perfect. I hope you are inspired by pictures that you see, but don’t let them steal your joy when you are working on something and it doesn’t look like what you see on Pinterest. Put some music on, see what you have on hand, mix it up, play around with it, be creative and don’t take it too seriously! A few key elements to make your table extra special……. 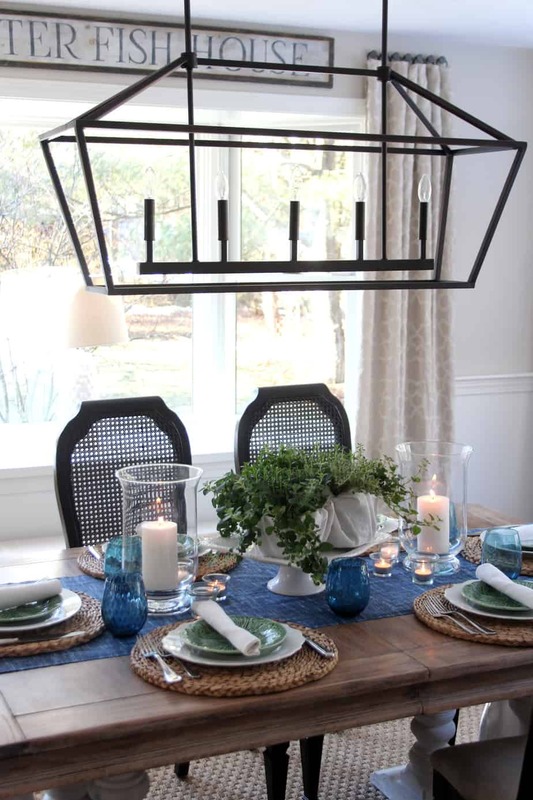 Layers at each placesetting – glass/crystal – metallics – candlelight – flowers or plants – linens. 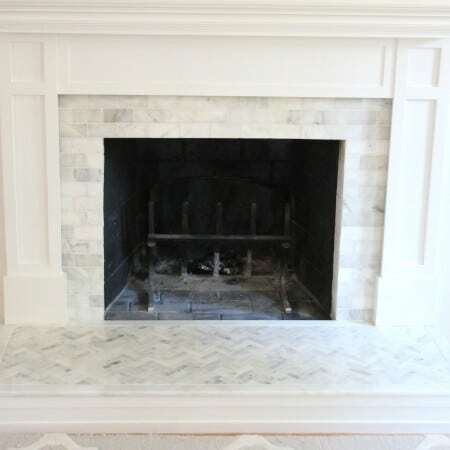 Vary the textures and bring in a little height to add some interest. Turn the lights down, light the candles, and enjoy your guests! I hope you enjoyed brunch at my herb garden table! 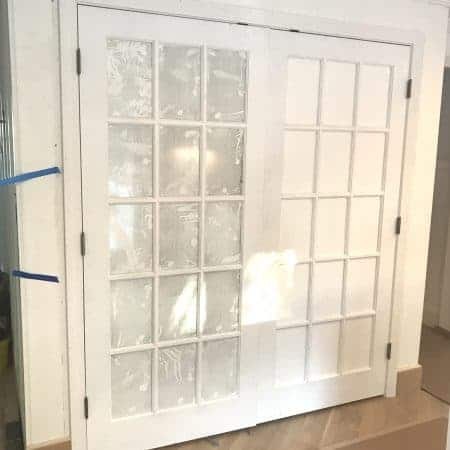 If you’re looking for any of the items shown in my dining room, here are sources for everything I could track down (FYI some of these are affiliate links). Now pop over to At Charlotte’s House next! 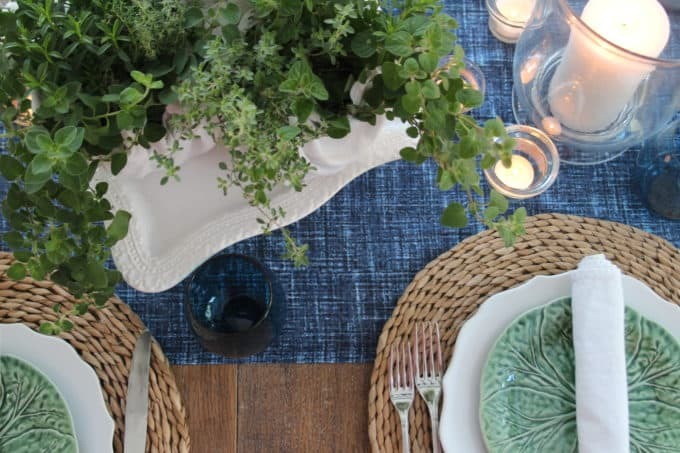 Visit all the blogs in this tour for more creative spring tablescape ideas! your table is my jam with those colors! love it! Thanks Cassie…..the bit of green is sustaining me through the end of the snow! I love this! 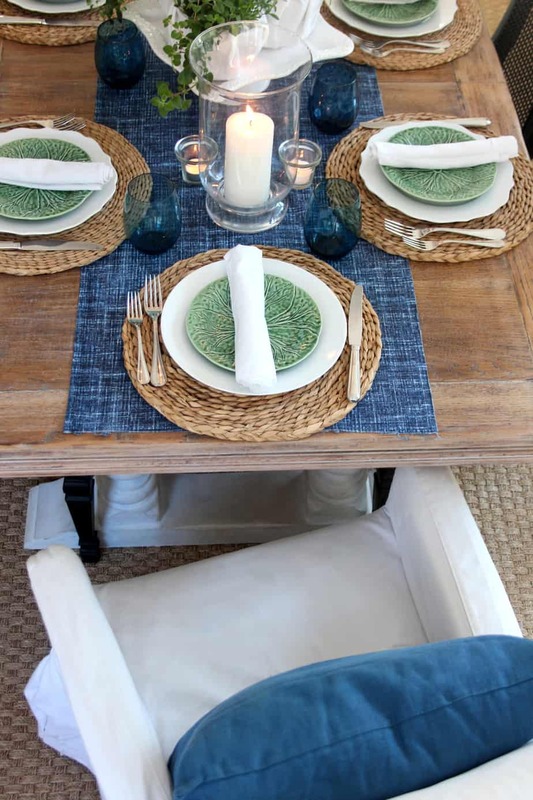 Blue is my new obsession for spring so this table is perfect to me! Blue is my obsession too Brenna. Not a traditional spring color but I love it with bright greens! I want to come over and sit down right now! Love it Lisa! 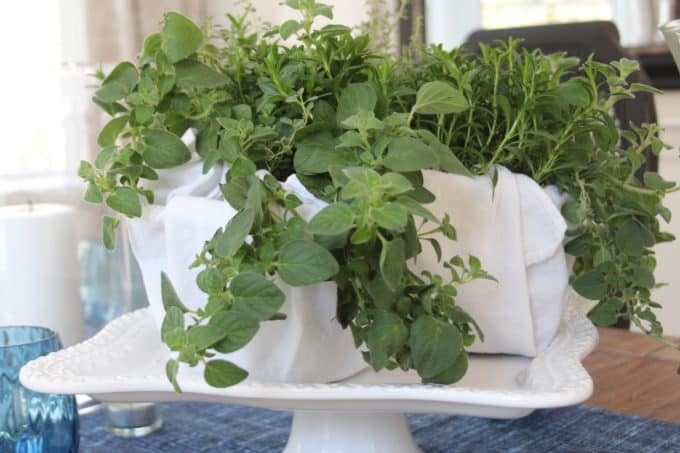 Those potted herbs are fantastic and I love the idea of wrapping the pots with napkins! Come on over Denise!! Scraps of fabric work great for wrapping potted plants too…….great way to gift them to someone! 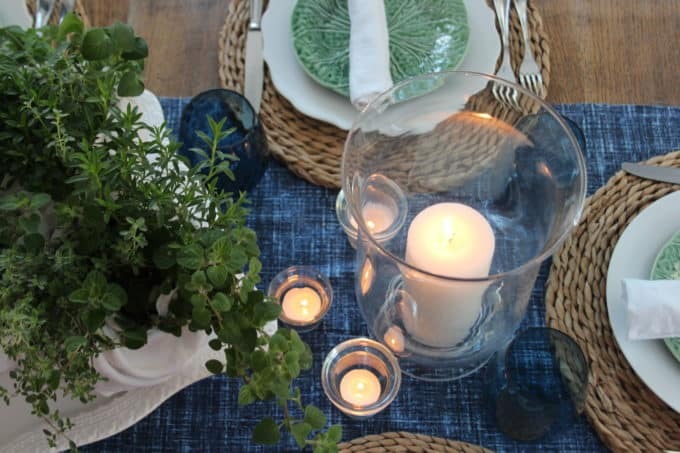 I love the simplicity of your table Lisa and the mix of greens and blues! So you! Jealous of your lettuce plates! 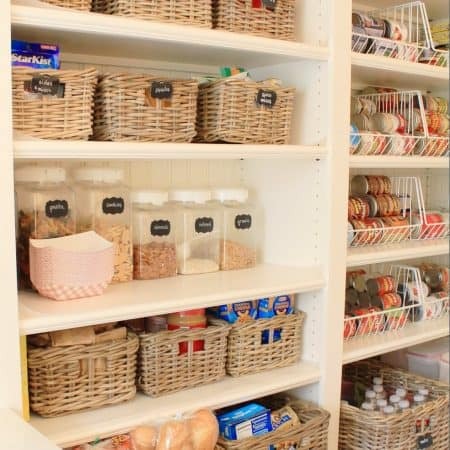 I do tend to love more simple tables (and decor in general) – you’re right Vel! 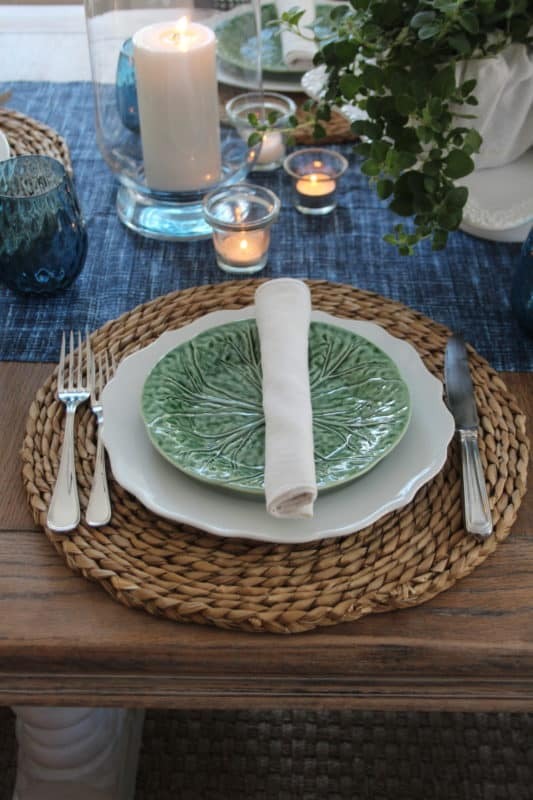 I see the cabbage plates everywhere – Homegoods always has a version of them! Sarah you are the sweetest! Thank you for your kind words. They make my day, week, month. I truly wish you would magically appear at my table my friend!! So beautiful–love the herb garden idea. That makes me so excited for spring!!! Thanks Amy! Spring felt like it would never arrive this year! I was happy to have all that fresh greenery while I waited impatiently! Thanks Kristin! I loved your blush table too!! Thanks Charlotte! I needed some fresh greens when the snow just wouldn’t go away!!!!! Your arragnement is so gorgeous! The simplicity and elegance come at the same time. 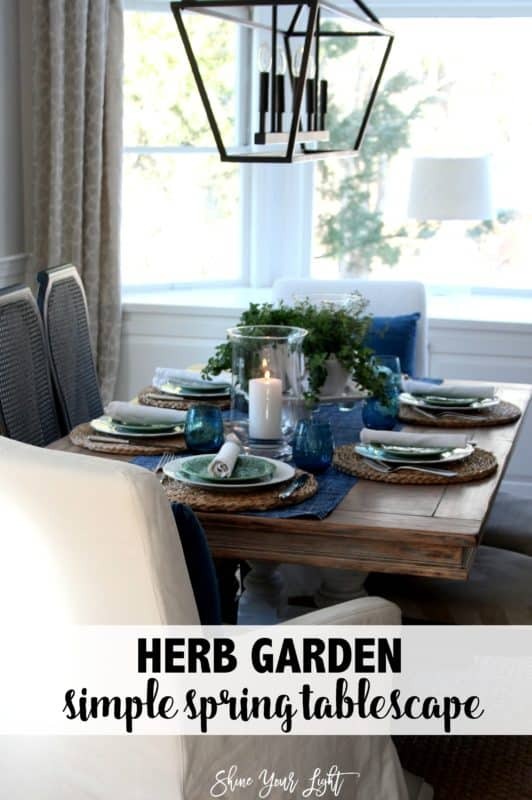 I sometimes bring my herbs to dinner table too. I love the blue/green color combo, Lisa! 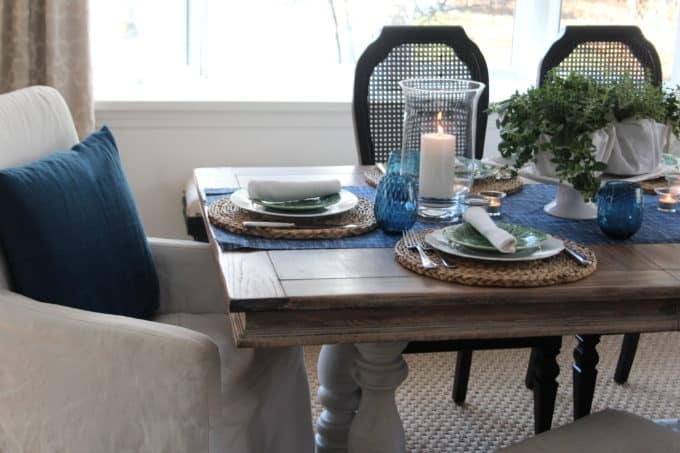 What a beautiful and inviting table setting! I love the colors that you choose. The blue runner with the fresh white and green is beautiful. I love that reminder, put out the pretty stuff you have and enjoy the people in your life! Lisa I love every detail. Thanks so much Laura! 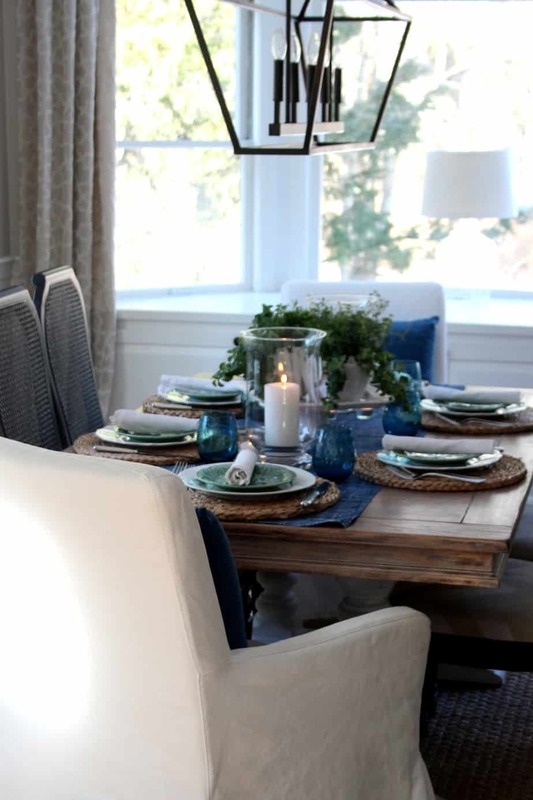 You are a girl after my own heart with your blue and white tablescape! Such a lovely table! How clever to wrap the pots in white linens! And I agree…LOVE how the herbs drape down the sides. It is all so gorgeous, Lisa!! Nice idea for wrapping the pots with white cloth napkins. It is really a perfect gift for guests. I just loved the whole decoration. I love it!! It’s casual, yet elegant – perfect for a spring meal! Beautiful tablescape, Lisa! 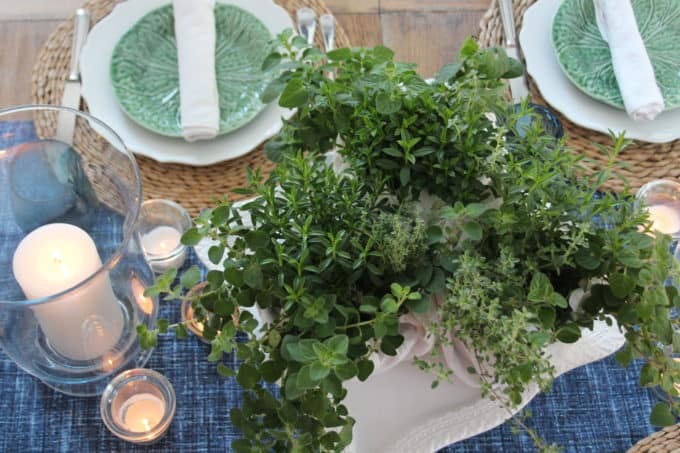 Love the use of fresh herbs for table decor. 🙂 Happy spring, my friend! Trader Joe’s herb pots where so pretty this year! Do you have one near you?